Palas Properties Ltd. trading as Tooting Market and any of its subsidiaries reserve the right to change any of its regulations as it sees fit. This document is not a legal binding agreement and is only general information on market and rental procedures. This document should answer most of your questions. For further information, feel free to contact us. 1. Your goods should be seen by the market manager before you can hire a unit. Samples of the goods must be shown so that the management can decide whether your goods are suitable for the market. In some cases, photos of the stock may be sufficient. 2. If the goods are suitable for the market then you will be offered a suitable unit to rent or be placed on a waiting list if there are no units available at the time. 3. Once entering the market, you are bound by the markets regulations and any noncompliance will be dealt with accordingly. 1. Rental Costs: Rents are paid on a weekly basis (once a week). Your rent payment is all inclusive of business rates, service charge, administration and other such costs used to run the market safely and efficiently. Electricity will be the only other cost which you will need to pay, however this will be directly to the electric provider e.g. EDF. Payment is made every Friday and that will cover you for 7 days of trade. If you vacate the unit, you must be out before the next rent payment date or you will need to pay an additional weeks rent. 2. Vacating The Unit: The units must be vacated of all its goods before the end of your last rental week. Any goods left in the unit may be sold or kept in safe storage at your cost. 3. Deposit: A minimum of 2 weeks deposit is required when hiring a unit. The deposit is refundable if no rent money is owed and no damage has been caused to the unit. 4. Opening Times: All units are required to open 7 days a week. The current opening times are Mon-Thurs 8am-6pm, Fri.-Sat. 8am-6.30pm and Sun. from 10am-4pm. Traders must have their shops opened by 10am. Opening times are strictly observed and failure to open at these times can lead to a notice to vacate the unit. 5. Tenancy Term (Contract): Please note that we offer our tenants Tenancies at Will agreements. This agreement gives the tenant the right to vacate their unit by giving a notice at will – whenever the tenant likes. This, however, also gives the landlords the same right to give the tenant notice at their will. In case of larger units, short term and long term tenancies may be considered. 6. Vehicle Access: Please note there is no vehicle access into the market. There are loading bays which must be checked prior to unloading or loading any stock. 7. Late Access: Please note that once the market is shut, there is no access to your units until the following morning. 8. Security: The market has 24/7 CCTV monitored surveillance. The market is also in the process of allocating a fulltime security during market opening hours. You will be given the direct number of our security which you can contact in case of emergency. 9. Parking: There is no parking available at Tooting Market. It is advised to find parking in neighbouring areas or to use public transport. 10. Food Units: When hiring a food unit, you must be sure to obtain a basic food and hygiene certificate. There are no other licenses required. 11. 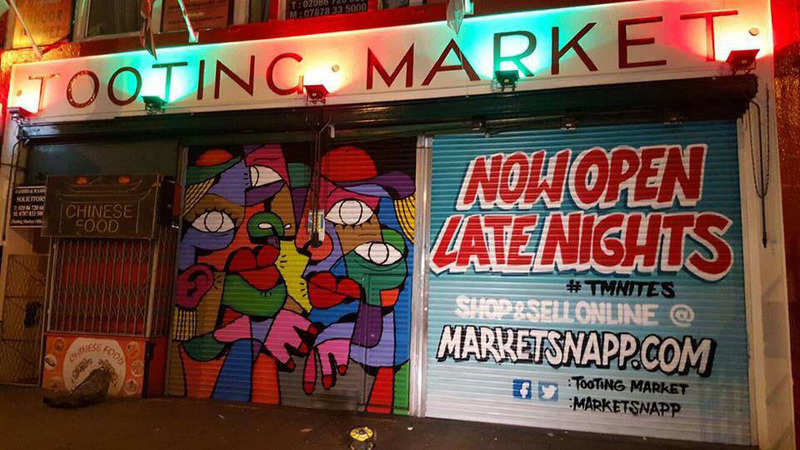 The Market is Changing: Tooting Market is currently undergoing changes to improve its facilities, types of trade and character. 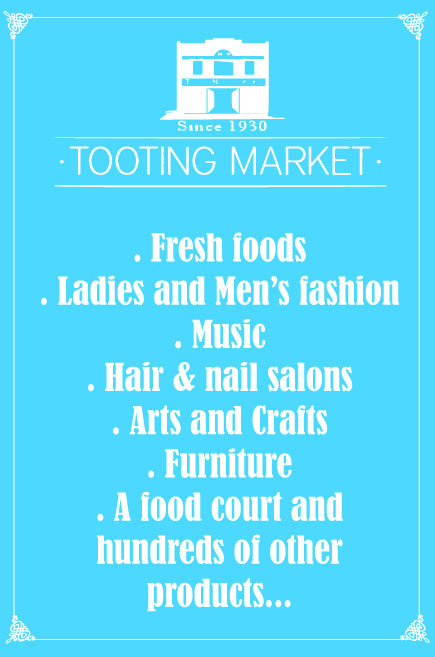 This may take some time but the long term objective is to create a wonderful and thriving market for Tooting and the local area. We advise all traders interested in Tooting Market to visit us and meet with the management for a full understanding of the positive changes heading the markets way. I have been living in Tooting for the last 22 years, and I find it a disgrace that Crossrail is planning to ruin the livelihood of some of the most established members of our diverse community for their own benefit. Capitalist pigs. All that huge sacrifice for trains to be late and cancelled.